Female Mormons set to pray in April, breaking new ground for church. Kim Raff | The Salt Lake Tribune Relief Society President Linda K. Burton speaks during the 182nd Semiannual General Conference of the LDS Church in Salt Lake City on Sunday, Oct. 7, 2012. Mormon women routinely speak at these conferences. In April, LDS women are scheduled to offer prayers as well, an apparent first in the faith's history. Scott Sommerdorf | The Salt Lake Tribune Ann M. Dibb, second counselor in the Young Women general presidency, speaks at the 182nd General Conference, Saturday, Oct. 6, 2012. Dibb is LDS Church President Thomas S. Monson's daughter. 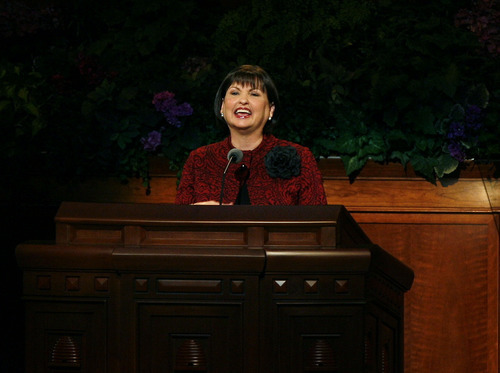 Mormon women routinely speak at these conferences. In April, LDS women are scheduled to offer prayers as well, an apparent first in the faith's history. The Salt Lake Tribune has learned that LDS women are scheduled, as of now, to offer invocations or benedictions at next month&apos;s General Conference  an apparent first in the faith&apos;s 183-year history. Church spokesman Scott Trotter would not confirm or deny the female prayers, saying only that "decisions on speakers and prayers at General Conference were made many weeks ago." Trotter made a similar statement about the schedule in January after a group of Mormons launched an effort called "Let Women Pray in General Conference." The activists urged the faithful to write letters to six high-ranking LDS leaders, including apostle Jeffrey R. Holland and three women who oversee church auxiliaries. The drive generated about 1,600 letters from 300 participants, said Analisa Estrada, a Salt Lake City graphic designer and one of the organizers. "The letters were beautiful and heartfelt." "Let Women Pray" backers personally delivered the letters to the various leaders or their secretaries, Estrada said, but have heard no direct response. They were naturally pleased by the news. "I am really excited," Estrada said Monday. "It&apos;s the kind of thing that came out of a lot of personal prayers on part of the organizers and the letter writers." For most of the LDS Church&apos;s history, its General Conferences have "tended to be pretty much male-oriented meetings," said Andrea-Radke Moss, a historian at church-owned Brigham Young University-Idaho, "simply because the [Mormon women&apos;s] Relief Society had carved out its own autonomous space for female discourse, prayer, etc., at their own conferences." From 1915 to 1970, the Relief Society staged its own two-day conferences, Mormon researcher Ardis Parshall said on the LDS history blog Juvenile Instructor, "with reports from the stakes and instructions from the General Board, with breakout sessions for, say, secretaries or education counselors or musicians or whatever." Lucy Mack Smith, the mother of LDS founder Joseph Smith, spoke at an 1845 General Conference, and other women occasionally followed, Janiece Johnson wrote on the blog. "Relief Society General President Belle Spafford spoke in the priesthood session of General Conference in 1946, teaching and encouraging bishops to work in a partnership with the Relief Society and utilize the expertise of Relief Society presidents." 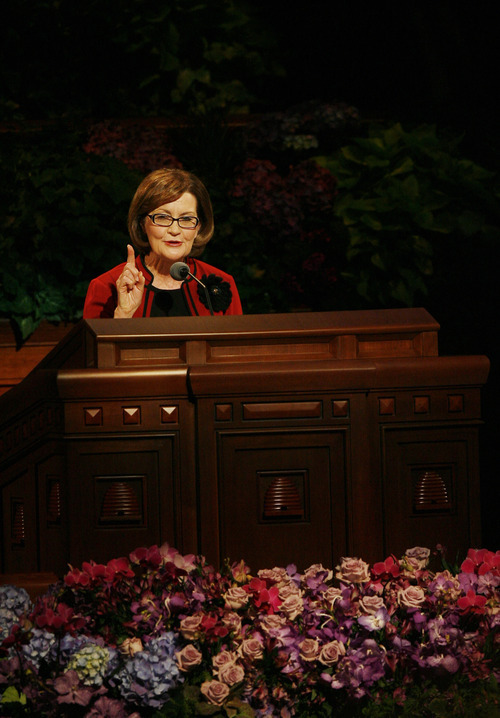 Nowadays  and during the past two decades  LDS women leaders routinely speak in General Conferences. As far as historians can tell, though, no woman has ever prayed at the general meetings. "I am unaware of any woman ever praying at General Conference. If it ever happened, it was generations ago," Parshall wrote in an email. "Ever since the &apos;Let Women Pray&apos; movement started, people have been combing the conference reports, but no one has turned up anything yet." In 1978, then-church President Spencer W. Kimball made an official statement allowing women to pray in Mormon sacrament meetings, saying "there is no scriptural prohibition against sisters offering prayers" and adding that it is "permissible for sisters to offer prayers in any meetings they attend." The statement did not, however, mention the church&apos;s large semiannual gatherings. Radke-Moss said seeing women pray from the pulpit at the April meeting will be "marvelous," yet "long overdue." In LDS culture, "it&apos;s OK for men to speak to both men and women, but it&apos;s usually only OK for women to lead and teach other women or children," the historian wrote in an email. "I love anything that opens the way for women to have spiritual and doctrinal expression in front of mixed-gender audiences." Alice Fisher Roberts also lauded the move. "As a Mormon woman, it makes me feel happy," said the Centerville mother of four sons. "It should have happened years ago, because there&apos;s no rule against it." Roberts remembers sitting in her LDS worship service as a small child and seeing a ward leader come down the aisle to where her grandmother was sitting and quietly asking the elderly woman to offer a prayer. "My grandmother became the first woman to ever pray in sacrament meeting in our ward," Roberts wrote in an essay posted at Feminist Mormon Housewives. "I don&apos;t think my grandmother&apos;s life changed because she was invited to pray in sacrament meeting. What changed is that, in my life, I&apos;ve never had to wonder why women aren&apos;t allowed to pray in sacrament meeting. … I hope my granddaughters have the same experience with praying in General Conference." Next month, that hope is to become a reality.